Sigma Beauty Affiliate Program: Welcome to the Sigma Beauty Affiliate Program! Welcome to the Sigma Beauty Affiliate Program! Sigma Beauty is proud to offer a great partnership opportunity for those who enjoy our brand and products. If you like quality products, fun designs, and great customer service, the Sigma Beauty Affiliate Program is for you! The Sigma Beauty Affiliate Program allows you to profit from sharing information and opinions about the products you love. It is, at its core, a referral program. You will receive a 10% commission on purchases made by new clients using your affiliate link. You will also receive a 1% commission on purchases generated by your sub-affiliates. Sub-affiliates are clients that have become new affiliates by clicking on your affiliated link. There are up to 4 levels of sub-affiliation. 1. Open a PayPal account at http://www.paypal.com. If you are unable to open an account, you may receive your commission as a store credit that can be exchanged for products. 2. Create a Sigma Beauty customer account at http://www.sigmabeauty.com/login.asp . 3. Log out of your new Sigma Beauty account and click on the link below (displayed on the home page) to open your affiliate account. 4. Click on ‘Continue’ and fill out the required information. If you are a US citizen, you will need to enter your social security number for taxes purposes. If you reside outside the US, there is no need to enter a tax ID number. Once you set up your affiliate account, you can log in to ‘My Account’ and access your affiliate page by clicking on ‘Visit My Affiliate Page,’ under ‘Affiliate Information.’ This will bring you to your affiliate table. This table will allow you to track clicks and commissions generated by your link. Your affiliate link is displayed under the ‘Affiliate Link’ section. There are different ways you can share your affiliate link. Your link can be shared in blog posts, in the info box of your YouTube videos, through your Twitter account, e-mail signature, Facebook account, etc. It is important to understand the structure of your link and how you can manipulate it to direct clients to specific products. To direct clients to the home page of the Sigma Beauty website, just copy and paste your link AS IS. Note that you need to add ?Click=XXXX right after the product’s URL, without any spaces. The ‘?’ IS NEEDED to generate a functional link. There are 2 ways you can share your affiliate link using a banner format. You can generate banners through your affiliate page or you can use the variety of banners that we offer throughout the blog. Pre-set banners: There are 3 options of pre-set banners available on your affiliate page (see below). An HTML code that already contains your affiliate link is available for each of these banners. All you have to do is copy the code for the selected banner and paste it onto your blog or site. Sigma Beauty now offers cash bonuses through the Rewards Program! Your bonus will be sent to your PayPal account at the time as your monthly payment. Affiliates in the Bronze category will be entered in monthly giveaways to receive Sigma Beauty products. We will contact the winner by email each month. The preferred method of payment is by PayPal. When you sign up to join the Affiliate Program, you will be asked to provide your PayPal account information. Your commission will be sent to you every first of the month using this system. If you are unable to open a PayPal account or if PayPal is not available in your country, you may choose to receive your commission as a store credit. In this case, you will receive a gift certificate with your commission amount in addition to your monthly rewards. If you prefer to receive your commissions using the store credit format, please contact affiliate@sigmabeauty.com. We are here to help and we want you to succeed. If you have any questions regarding the information provided above, please contact us at affiliate@sigmabeauty.com. Your feedback is important to us. Ready to get started? Welcome to the Sigma Beauty team! I've been an affiliate for the past several months now and I'm wondering, do past commissions count towards the new rewards program? Or are they starting fresh? @Supriya: No, you do not need a blog to be an affiliate. There are many ways you can share your affiliate link. We will cover these topics in future blog posts. @Christine We will be posting success stories, interviews, and strategies on how to become a top seller in future blog posts. I love this Sigma! I have the chance to introduce my favourite brushes to friends and family AND I can make a little cash at it aswell! <3 This is a great way to build your company! On the table of my summary sales what does click through mean and does it count towards anything? What is what c is to us to make l advance d money(silver) for the command(order)? @MakeupbyBri Thank you! This is our main goal! @Melissa 'Click through' is the number of clicks that your link received. It does not count towards commission, unless it generates a sale. @Sanddy You will earn a 10% commission on purchases made by new clients using your affiliate link. Is possible to give a code of reduction that I would give with my link sponsoring? @Laurice We are working on our next post and our goal is to post frequently on success stories and strategies! What is that you can make me a pourune discount(delivery) personal command(order)? Discount? The brushes are a steal to begin with and you get a free gift. Tell them they don't need a discount code because the brushes are already reduced in price. Is it working worldwide? love Sigma, great brushes, great company! @Carine - yes, the Sigma Beauty Affiliate Program is available in any country. I may missed something, but is there a cost to join the program? I signed up for the scheme but wasn't asked for my paypal, how do I give you it? @Kristine There is no cost to join the program. My sales were 7 , then after 2 days , then again became 6 .. How is so? @Fizza-Glamorama This happens when someone has cancelled their order. Your sales (but not clicks), will decrease by one. @KrispyTinCan If you live in the US, you will have to provide your SSN for tax purposes. The system is secure, so your SSN will be safe. I'm not 18 years and neither my mother has a credit card. How to I send them my paypal info? @Mariana P. While there isn't a specific age limit for the program, we recommend participants under the age of 18 speak to their parents about the program before signing up. If you are unable to sign up for PayPal, you can receive your commission payments in the form of gift certificates that can be used to purchase our products! @Heather If you have already signed up for the Affiliate Program, you can send your PayPal information to affiliate@sigmabeauty.com. Hi i just wanted to know is being a affiliate like a real job would i have to do taxes for doing this. @Kassandrea Yes, when signing up for the Affiliate Program you will have to provide your Social Security Number for tax purposes. do I have to pay to be an affiliate? some companies require you to buy your starter products in order to be a representative... is this the same or do you just open paypal account to get paid? @Nadjia You do not have to pay anything to become an affiliate! You will need a PayPal account, but this is only so you can be paid directly. When do the comissions happen? Which day of the month? And this month(till now)I only got 4.74$, does that mean that I won't get these money? or they roll over the next comission? @Fabulousyougirl The commissions are given on the first of every month. If you do have a PayPal account, you will get paid the $4.74. If you do not have a PayPal account, that amount will rollover and combine with your next month's commission. Hi there, How do you know if you have any sub affiliates? For example I am writing up a review and wanted to suggest followers to join, how do I get them to join through my affiliate code? So that they then become my sub-affiliates? Thanks! Hi, I would like to know why is the amount I received in the Paypal is the amount in "My Comission" minus off "Sub Affiliate Commission" ? @Sherrie While you are welcome to recruit sub affiliates, you will earn 10 times more commission when sharing your personal affiliate link. You earn 10% commission on purchases made by first time customers, versus 1% commission your sub affiliates. @Lovely Adornment The amount under the "My Commission" column is the overall earnings in your affiliate group. This includes your 10% commission, your affiliates 10% commission and your 1% commissions on your affiliate sales. To determine the value you will receive, you will need to subtract your affiliates commissions, leaving you with your 10% commission on your sales plus the 1% commission on your affiliate sales. We apologize for any confusion surrounding the affiliate table, and we are currently modifying the table to make it more user friendly. não entendi bem como direcionar meus seguidores atraves do banner para a minha página na sigma. @Clau Jambo Once you become an affiliate, you can log into your Sigma Beauty account and click 'Visit My Affiliate Page' under the 'Affiliate Statistics' section. Under the 'Advertising Tools' header, click 'Generate Banner Ads'. You can then copy the URL and paste it on your blog to generate the banner. I am from Portugal... I need the Tax ID? @Nezyta You will not need to provide a Tax ID if you live outside of the US. Your SSN is used to for tax purposes for US citizens. I've signed up for the affiliate program and I have a paypal account but WHAT paypal info do I have to send to affiliate@sigmabeauty.com?? (I'm really confused... what information from paypal do they need need specifically?? and on my paypal account did I need to have entered bank account info to receive funds from Sigmas affiliate program or is a VISA # enough? @Nikosmommy After you have signed up for PayPal and joined the Affiliate Program, you just need to send your email address associated with your PayPal account to affiliate@sigmabeauty.com. Your commission money will be deposited into your PayPal account, and from there you can transfer it to your bank if you want. I have just tried to join, I'm from the uk and its not letting me past the tax id.. I don't know how to get by that part. Great! Thanks for the prompt answer! @Ainsley x Only US citizens will need to enter their SSN for tax purposes. If you live outside the US you do not need to enter anything! I have tried to continue, but without entering anything in the tax I'd field, I am just stuck on the same page unfortunately. I live in the UK. @Emma You can choose any of your social networking sites that you plan on using. You YouTube channel, blog, or Facebook page will work! Someone from my work asked me to order some brushes for her. I did but now i'm not sure if that gives me profite as an affiliate? @KaleyPenny You will receive credit if your co-worker was a first time customer and used your affiliate link to complete the purchase! You do not receive commission on purchases you make using your own affiliate link. Do we have to pay taxes on our commisions we make? @kkierston If you are a US citizen, you will have to pay taxes on your commissions because it is a source of income. Boa noite, acabei de me afiliar, estou tentando mandar um email para affiliate@sigmabeauty.com, mas está voltando. gostaria de pedir que minha comissão venha em formato de credito da loja. @Flavia Veiga Please email annie@sigmabeauty.com using the email address you used to sign up for the Affiliate Program. Your account will be updated! If we recommend products for you, can we use pictures from your site (any?)? Or must we photograph the products ourselves? @gianasister You can use photographs from our website! Me tornei afiliada hoje mas não tenho essa conta do paybal e eu queria mesmo era receber isso em forma de presentes... neste caso o que devo fazer? @Minhas Coisinhas!!! Please email affiliate@sigmabeauty.com and let them know that you would prefer gift certificates instead of PayPal deposits. Obrigada! e-mail em inglês ou português? kkkkkk essa eu quero ver! @Minhas Coisinhas!!! Either English or Portuguese, we will translate it if we need to! I made way over $5 in March but did not get my commission. Everyone else seems to have gotten paid as it said on Twitter. I didn't get paid and didn't get an email. Does anyone know why? I'm trying to add an ad to my blog, where do we find a code for the banner? @Katherine Please email annie@sigmabeauty.com with the email address you used to sign up for your account, and I will look into it for you! Love Love Love the give-away idea. Ever since I started my give-away yesterday, it has generated so many page views on my blog I love it! Can't wait to receive the Miss Taylor Kabuki Brush and review it on my blog... Thanks Sigma! Hi! you have the latest banners then you said that just copy the banners below and then add my affiliate number... but it doesn't work... how am i suppose to post your new banners on my blog? Just want to say that I'm loving my new life as associate. Hey sigma.... i love you soo much... my question if i do purchases do i get any rewards or qualify for reward program? @Mahrukh Hayat Blog The Rewards program is based on the commissions you earn through the Affiliate Program and you do not receive commissions on purchases you make through your own affiliate link. Each month you will receive a gift certificate for Sigma Beauty based on the amount of commissions you earned! Ola nao estou conseguindo me tornar afiliada. Eu moro em Londres e quando me perguntando o meu ID tax numer e eu deixo em branco eles nao me passam para a proxima pagina, eles continuam pedindo o ID tax number. O que eu faço? @Vanessa Sotto You will only need to enter your Tax ID if you are a US citizen. If you do not live in the US, you can enter any number in this spot ("123" would work)! Everyone is accepted?Or it is a selection ? if i want to receive my comission by getting sigma certificates instead how do i let you know and do i still have to enter my social security number? @Anonymous You will need to enter your Social Security Number if you are a US citizen. Please email affiliate@sigmabeauty.com if you prefer to receive your commissions in the form of Sigma Beauty gift certificates. thank you but why do we need to enter our ssn#? @Anonymous You will need to enter your SSN because you will be earning income through the Sigma Beauty Affiliate Program, and you will need to report it at tax time. Hi,how can I add the code to my facebook page. @Fifi You can get a lot of tips about using Facebook as an affiliate from this blog posting: http://sigmabeautyaffiliates.blogspot.com/2011/03/sigma-beauty-affiliate-strategies.html! I don't understand...How I have to inform paypal? What I have to do? thanks so much! @Kikka0880 Please email affiliate@sigmabeauty.com with your email address associated with your PayPal account! Hello, I have a blog in Brazil. It's a new blog and has just over 200 followers. Can I subscribe to be affiliated? How would you guys know if we had a Paypal account open? @Flora Wamy We would love for you to join the Sigma Beauty Affiliate Program! If you have any questions, please contact affiliate@sigmabeauty.com. @Jessica Batres For any questions regarding your Sigma Beauty account, please contact affiliate@sigmabeauty.com. I am trying to sign up for the affiliate program and I have been required to type in a Tax ID#. I am from the UK thus do not need to fill out this bit, but it won't let me continue without filling this out. What do I do? @Fernanda Kelly If you are unable to set up a PayPal account, I can send you a Sigma Gift Certificate as your affiliate commission payment. The gift certificates can be used on our website toward your favorite products! @Tamiinu_x If you do not live in the US, you can enter any number in this spot ("123" would work)! Ola, eu não consigo criar uma conta no Paypal como fica então? Já sou afiliada, prefiro um certificado de presente como faz? Thank you for your attention, I love the Sigma! @PRODUTINHOS NO CABELO AND MAKEUPS If you are unable to open a PayPal account, we are able to send you a Sigma Gift Certificate for your affiliate commission payment. 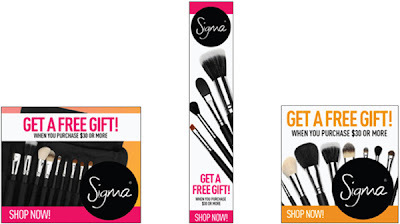 Please contact affiliate@sigmabeauty.com to confirm that you would like to receive a gift certificate as your payment. Thank you! @Natalia Malta Yes, feel free to use any banner that you see on our blog! If you have not already, please send your PayPal account information to affiliate@sigmabeauty.com. can you tell me how many sub-affiliates can i have? @Sahrish Adeel You are able to view the number of sub-affiliates on your commission table. You can log in to ‘My Account’ and access your affiliate page by clicking on ‘Visit My Affiliate Page,’ under ‘Affiliate Statistics.’ This will bring you to your affiliate table. Hi, can I use a prepaid card paypal? @Anonymous Yes, you should be able to use a prepaid PayPal card for your purchases. For any additional PayPal questions you can contact affiliate@sigmabeauty.com. can you stop being an affiliate? @Anonymous Please contact affiliate@sigmabeauty.com with any questions about your account. Sorry if I missed something, but if my paypal is the same as the email I entered when I became an affilate, do I still have to email it to you? And, do you fall back to the bronze member each month, or are these based on the products you'll sell in a year? Like, if you were a diamond affilate, would you next month have to get the 1000 dollars again, in order to receive the rewards of a diamond affilate? @Pauliina Please send your PayPal email address to affiliate@sigmabeauty.com to have your account updated. The Rewards Program is a monthly program, Every month your earnings will starts over. @Anonymous When you visit the Sigma Beauty website, click the 'My Account' buttom on the ride side of the page. If you already have an Sigma Beauty account, enter your email address and password. If you do not, you can create an account at this time. Once you are logged in, click the 'MAKE MONEY! JOIN THE AFFILIATE PROGRAM!' button on the left side of the screen. You will then be able to continue the process of signing up as an affiliate. What if I did not earn anything from my affiliate program for the past year? Do i still need to show it on my tax records. My income is nil. Pl let me know! @Anonymous You do not need to show your income on your taxes if you have not made money through the Affiliate Program. @Cyntia Melo To access your affiliate banners, log into your Sigma Beauty account and click the 'Visit My Affiliate Page'. Then, click the 'Generate Banner Ads' link. An HTML code that already contains your affiliate link is available for each of these banners. All you have to do is copy the code for the selected banner and paste it onto your blog or site. Hi, it says that I can get %10 on my direct sales; how do I make a direct sale? @Ivanna Miretti You will earn 10% commission on all purchases made by first time customers who use your affiliate link to make a purchase! You will also earn 1% commission on purchases generated by your sub-affiliates. what if they just go to the link and wont purchase anything? will that count? @lyan You will not earn commission from the number of clicks you have on your account. The commission table will show you how many clicks you have on your link and how much commission was earned from customer orders. @Renata We are not currently accepting applications to the Incentive Program at this time, but you can apply for complimentary products as soon as we start accepting new applications! I don't have a Tax ID# but I am a US Citizen. How do I get a Tax ID# or where can I find mines? @Miss Tanya Vintage Your Tax ID your Social Security Number! I don't know where should I paste the banners on my blog. help please. @Azumarile It is best to paste your affiliate banners near the top of your blog page, making it immediately visible when you visit your blog. This will increase your click and sales numbers! @Jazmyn You can contact annie@sigmabeauty.com and she will send you a "Representative Badge"! so I live in france and I want to make an afiliate account it is all free ? @Leila Yes, signing up is free! You'll receive 10% commission on all first time customers who use your link to make a purchase. Oi amores, tem uma duvida!!!! Sou Afiliada e gostaria de saber, quando eu atinjo a primeira meta que é 99 seguidores, como faço pra ganhar o primeiro pincel??? Does sigma charge you anything to start up? or are you penalized if you decide to delete your account later on? @Define Love It is free to set up your account, and you can delte it free of charge at any time! OK so im really confused. I already signed up for the affiliated program & for paypal, but how do i like the two?? Where do i do, what do i click? @Define Love Please contact affiliate@sigmabeauty.com with your email address associated with your PayPal account! We will link the two for you! @Anonymous Any commission that you earn is for your own personal use! Each month we will send the money to your PayPal account, and from there you can transfer it to your bank account. If you would like, you can recieve your commission in the form of gift certificates. Each month you commission is emailed to you as a gift certifcate, and you can use that to purchase Sigma Beauty products! You can email any additional questions to annie@sigmabeauty.com! Olá, Amoooo todos os produtos da Sigma e ficaria muito feliz se eu pudesse me tornar uma filial!! Eu tenho uma dúvida... minha conta no youtube ainda é nova e por enquanto não posto vídeos de maquiagens e etc como a maioria das meninas fazem. Adooro tudo o que se refere a beleza e novidades. Não possuo blog. Seria possível eu ser uma filial nessas circunstâncias ?? Obrigada, aguardo anciosa. @Francine You can definitely still sign up for the program! There is no minimum number of followers or subscribers that you need to have. You can sign up for the program here: http://www.sigmabeauty.com/Affiliate_info.asp. @Francine Only US citizens will need to enter their Tax ID! If you do not live in the US, you can put any number, such as 123! I'm trying to sign up for a Paypal account, but out of the three options which one do I sign up for? Individual, Premier or Business? Recently I affiliate with Sigma even though Brazilian! Things are beautiful! Sigma Congratulations team! I created a paypal account. Any problems? I put a banner on my blog. I would like to know how to get their products in order to do reviews and contests for my readers. @Heaalb Individual would probably be your best option! acabei de afiliar estou muito feliz! Hello. I already became a affiliate yesterday. I have a question. If I purchase directly to you does it counts to this program? Do I have a quantity discount? How does it works? @Anonymous You do not earn commission for purchases you make using your own link. You do earn 10% commission on purchases made by first time customers who use your link to buy products! If you are interested in wholesale, you can contact wholesale@sigmabeauty.com for more information! Hi, I just joined today & I was wondering how do I connect it to my paypal? @kristinconway You can email affiliate@sigmabeauty.com with your PayPal email address and they will connect your account! If you are under the age of 18, and you earn some profit. Does you parents have to put this on their tax forms? @Shanicexoxo If you are under the age of 18, you can still sign up for the program with your parent/guardian permission. You will use your own Tax ID/SSN when signing up. You can contact affiliate@sigmabeauty.com with any other questions! hi i already signed up for the affiliate program and i wasn't sure about sending my paypal info. what do i have to send you? is it my password ad my email account to you guys? or what do i have to send you? @Anonymous Please send your email address associated with your PayPal account to affiliate@sigmabeauty.com! Hey, I have a doubt: the e-mail that I need to send to Affiliate@SigmaBeauty.com is the account that I've registred at paypal, like myname@gmail.com? @Gabe Candido Yes! You can send the email address associated with your PayPal account to affiliate@sigmabeauty.com. It will be your email address that you signed up to PayPal with! Do I have to be older than 18 years to be an affiliate? @ZoeT If you are not 18 years old, we recommend that you ask permission from your parent or guardian before signing up for the program! Dear Sigma, first of all I command you for your fabulous products and also your patience in answering each and every single question here :) I did read through all of them and I apologise if I missed anything I'm about to ask. I'm a makeup artist in the process of setting up a blog but this will take a while yet as I travel a lot. I make majority of my product recommendations through the group makeup lessons I give and personal clientelle base I have. Is there an option of a link which I may be able to email to my clients, which will then direct them to my affiliate on your page (rather than through the advertised banners, til I get my blog up)? I remember there was an answer which said to put links of particular products followed by ? and the affiliate number but I'm a bit confused. I can use your banner on my personal facebook page, however, I'm not too sure exactly where on my facebook page to advertise it. I'd rather personally advise my clients via email with a link of my recommended Sigma products and make it more convenient for them to purchase; than advising them of my FB page and waiting for them to click the banner. I know I can generate so many sales til I have my blog up and running which is why your help and recommendation as to how I should do this is greatly appreciated. @Sarah Thank you for your interest in the Sigma Beauty Affiliate Program! Once you join the program, you will receive a unique affiliate link that can be shared in blog posts, in the info box of your YouTube videos, through your twitter, e-mail signature, Facebook account, etc. If you have a lot of interaction through email, you can definitely use your affiliate link in your emails with clients. Please contact annie@sigmabeauty.com with any other questions! Is there a discount code i can give my fans at checkout? @Anonymous We are unable to give the codes out, but you are able to find the discount codes in some of the popular magazines! How could I know that I did everything right? if I was unable to have a paypal account, what does that mean? @FashionFreak/Mihaela If you are unable to have a PayPal account, we are able to set your account up to receive Sigma Gift Certificates as your payment. Please contact affiliate@sigmabeauty.com with your information or additional questions. I need help! I just become an affiliate and how do I get a banner for my YouTube channel and my blog?! @TheMissGlam101 To access your pre-set affiliate banners, you can log into your Sigma Beauty account, click the "Visit My Affiliate Page" link, and then the "Generate Banner Ads" link. You can then copy and paste the URL directly onto your blog! I'm from Brazil.What kind of number should I type there? @SARA Please enter any number that you will remember. If you have any additional questions contact affiliate@sigmabeauty.com. Thank you! how many likes do i have to have on my facebook fanpage and how many subbies do i need to have on youtube to do a review and have a sponsered give from sigma please let me know thanks. @Anonymous Please contact affiliate@sigmabeauty.com to request Sigma banners in Portuguese. Thank you! What does mean ''people in level'' in that table on the main page of affiliate? @Anonymous The table that is shown is for the Rewards Program. Affiliates are automatically qualified for the program by how much commission is earned each month. The rewards are based on different levels. Please contact affiliate@sigmabeauty.com with any additional questions. @Anonymous The application is asking for you to list a website address such as your Facebook, YouTube or Blog page. If you have any additional questions, please contact affiliate@sigmabeauty.com. It Never asked for my PayPal account information. Hi! I'm just wondering about the categories, how do I know in which one I am... It changes every month? @April Emery Please email affiliate@sigmabeauty.com with your PayPal information and any additional questions. @Nancy The categories for the Rewards Program reset every month. You are able to look at your commission table and the total for that month will be the category that you qualify for. Any additional questions, you can contact affiliate@sigmabeauty.com. @obsessedwithmakeup11 You will be able to copy and paste the banners to your site. Please watch the video on this link http://www.sigmabeauty.com/Affiliate_info.asp or contact affiliate@sigmabeauty.com with any additional questions. @elizabethsbeauty Yes, you are able to post banners on your facebook page! @Anonymous PayPal is an online business allowing payments and money transfers to be made over the internet. For more information, you can visit their website: https://www.paypal.com/.